You'll Never Look at Vegetables the Same Way Again. "The soil-encrusted root, gnarled like the bark of an old tree, hides a creamy flesh that is both earthy and sweet. Snapped in half, it smells of freshly dug ground. Roasted in butter, it smells of warm heather honey. I value the parsnip for its gentle sweetness. 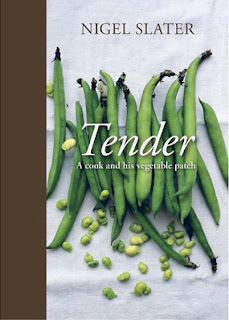 . ."
That quote was the beginning of the chapter on Parsnips in Nigel Slater's Tender: A Cook and His Vegetable Patch. I checked this book out from the library and have renewed it three times because I don't want to give it back. Be flexible enough in your tastes to buy what's cheap. A possible third might be: grow food. I have never eaten turnips, rutabagas, or beets before in my entire life (as far as I can recall, anyway.) Not going to lie, despite their perpetually reasonable 99 cents/lb these are just some vegetables that never really caught my eye. Since reading Tender, I have been obsessed with the idea of beets. . .Golden ones raw in salad. . .Purple ones grated into brownies. . .The stuff dreams are made of. So if you'd like to broaden your vegetable horizons—be inspired to try out new things both in your kitchen and your garden—check out this book. Slater's mouth-watering prose is sure to get you dreaming. He imparts wisdom not only as a chef, but as a gardener. Get the insider's scoop on growing carrots, storing cabbage, and preparing asparagus all from the same expert source. I love it. I wouldn't call it a book of frugal recipes, as some of the ingredients are pretty off-the-wall for my cheapskate kitchen. . .But when I go to the grocery store, my gaze doesn't slide over rutabagas as automatically as it did formerly. A diverse and flexible appetite is a Frugal Win. Tender also makes for very soothing bedtime reading. Though that is coming from a girl who frequently goes to bed with cookbooks on the nightstand. . .
Do you read cookbooks? What are your favorites? Thanks for your post. I consider myself to be frugal and also love to read cookbooks. I check cookbooks out of the library, and also look for them in thrift stores. My favorite find was "Easy Cooking For Today" by Chef Pol Martin (1986 publish date, $59.95 SRP). At $3.99 this book is filled with photos that document each step of the process, removing concern that "I'm not doing it right" when using his recipes. I'm so glad I bought this one, I always feel guilty when I renew a library book more than once. Keep the frugal food coming. Thanks for reading, Lisa! :) Wow, what a great thrift-store find!